Wow what a cool drop. Nose: dark spicy honey on biscuit, malt sugar, raspberries and grapes, vanilla, an earthy and slightly smoky oak note, tobacco can. Intense and old-looking with lots of wood and subtle smoke. Taste: full and supple with lots of spice and oak. black tea with a spoon of honey, pepper, toffee, garden herbs and a beautiful wood note (cinnamon and chocolate). The finish is dominated by bitter oak (old tea leaves and wet wood) and herbs, but at the end the honey and a dry sweetness accompany the long finish. Great nose and even better taste / finish. It has depth and shows its age - but you must be able to get rid of oak. 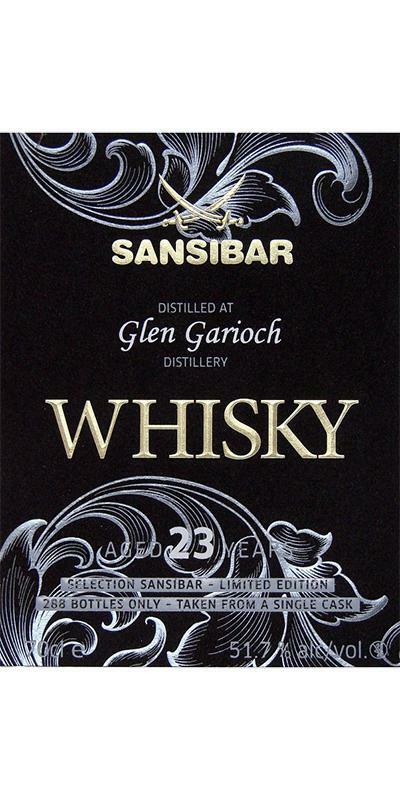 These old Glen Gariochs with the subtle smoky notes are really great. Complex nose, closely interwoven flavors. It takes a while for this to be clear. But then first vanilla sugar separates, after some time honey, maybe also sugar beet syrup, marzipan bread. Very supple, very pleasant in the nose. Silky and creamy on the tongue, no sharpness, despite over 50%. The various flavors are faster on the tongue than in the nose, but are essentially a mirror image of the same. Again, some ingredients of a cake: vanilla sugar, honey, marzipan. In addition toffee sweets, milk coffee. Over time, spices such as cloves, thyme, basil, oregano and pepper are added. The oak takes its place after a while, but is not too dominant. Long, still creamy, fine honey sweetness and a lot of marzipan. If you take a look at the emptied glass, the spices will show themselves again. 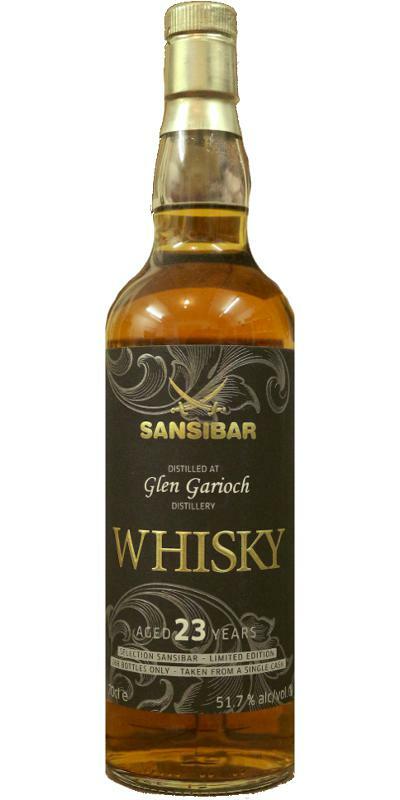 [October, 2017] Part six of my little new tasting project to find out if all Glen Garioch distilled in the early nineties really are above average or if I can find a below average sample. I bought this bottle for 139 Euro in November, 2016.The colour is amber and the texture shows small sticky tears that transform slowly into a sticky ring at the top of the glass and after a while this builds some fat tears with very, very slow legs (an excellent oiliness that promises a great mouthfeel). The nose is rich on barley sugars, tea leaves, citric fruits (oranges) and spicy wooden aromas. All in a nice balance and without any flaw. The initial mouthfeel is great just as the texture promised: It immediately coates the whole of the mouth with just a slight peppery feeling and some minor dry moments (metallic) that are a nice contrast to the sweet barley sugars. The taste is bold with some smokey notes on top of the vanilla and orange driven flavours profile, a great pairing! Again lots of sugars and spices in an adequate wooden structure - all is nicely chewable and offers more and more flavours the longer you keep it in the mouth (e.g., coffee). The finish is long and very sticky. It offers additional cocoa aromas that are delicious. Some water releases more oily aromas in the nose and turns the mouthfeel even smoother. The taste and finish loose a little bit of power but gain harmony and additional flavours from the reduction. Actually a like it that way better (it is an excellent swimmer so playing around with water is highly recommended). After-tasting after just over a year. Exciting. He really needs a lot of time. Too deep and versatile, it comes so that I only need a quarter of an hour to sort me. The nose is so complex and different. First, I miss a dominant heath and honey note. Then vigorously follows ginger, cloves, basil, oregano and cardamom spice carrier with a wide range of flavors. What else is there? A little peppermint, roasted aromas and dark chocolate. Some oak out the back. In the taste it brings all the aromas of the nose together and has citrus fruits, a harsh tobacco note in the taste show. Some baked apple and a marginal cinnamon note at the end. The taste is long, pleasantly warming. Very creamy with marzipan notes and some jelly-like on the end. Clearly Ü90 candidate! Thank you very much for the Adventsample Noface!